Allow us to assist your family in obtaining your dream home. 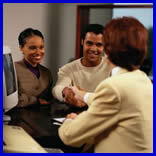 Our focus is in customizing the loan package for you and your family from our many available options. Talk with one of our loan personnel today, or inquire on-line and let us make your dreams come true. Fixed-Rate Mortgage Loan: With a fixed-rate mortgage loan, your interest rate and monthly payment will remain the same over the life of the loan. Adjustable-Rate Mortgage Loan (ARM): With an Adjustable-Rate Mortgage, the interest rate changes periodically, usually in relation to an index, and payments may go up or down accordingly. ARMs include interest rate caps, which places a limit on the amount your interest rate can increase. Balloon Rate Mortgage Loan: A balloon rate mortgage requires a lump-sum payment at the end of the specified term on the loan. Allow us to assist you with short-term financing during the Construction of your dream home. Also available: Construction-to-Permanent Financing, which allows you to lock in your rate for long-term financing at Construction. Allow us to assist you with short-term financing in purchasing a lot to build your dream home. Use the equity in your home to establish this loan. When you need a loan to make a larger purchase or consolidate debt this pre-established line of credit may be the answer for you. We are here to work hand in hand with you and your business. Whether you need working capital, equipment, expansion, cash flow or you are just starting up, we can help your business grow. Talk with one of our loan personnel today. There are many ways to pay the cost of a higher education. After considering all you federal loans, scholarships and grants you may still have a gap you need to cover to pay your total college costs. Chester National Bank works with iHELP Student Loan program to provide you an attractive private student loan that can help you to cover that gap.